Griffin Lotson of Geechee Gullah Ring Shouters demonstrating the ring shout at the Geechee Kunda cultural center in Riceboro, Georgia. Photo by Heather Hodges. During the spring of 2018, the Network for Landscape Conservation coordinating committee convened for an annual retreat in Charleston, SC, where it had the privilege to connect with and learn from the folks at the Gullah Geechee Cultural Heritage Corridor. The Gullah Geechee story resonated deeply with committee members, as it offers a powerful reminder of the many layers of meaning that are woven into landscapes – and the potential for landscape conservation practitioners to build connections across those layers. The Network asked Heather Hodges, Executive Director of the Gullah Geechee Cultural Heritage Corridor, to share the Gullah Geechee story – her piece offers a reflection on the interconnectedness of the Gullah Geechee cultural traditions and the lands on which those traditions were formed. The reflection is reprinted here with permission from the Network for Landscape Conservation. On a humid night in early June, a group of chefs and their guests came together in a field on a Johns Island, South Carolina farm owned by third-generation Gullah Geechee farmer, Joseph Fields. Gullah chef B.J. Dennis presided over an evening rich in foodways history and served a menu that included traditional Gullah Geechee dishes like okra soup and Charleston red rice. A pit barbecue fashioned of materials found on the farm held a whole lamb and pig sourced from neighboring Wadmalaw Island. Many at the dinner were familiar with the dishes on the menu but likely knew much less about the deep relationship between their Gullah Geechee hosts and the very land where they stood balancing their plates of barbecue and cornmeal fritters. In the last decades of the 17th century, rice was successfully cultivated in what is now South Carolina, and its production rapidly became the main economic activity. The Gullah Geechee are the direct descendants of people who came from different, often highly sophisticated agricultural societies of countries we now know as Senegal, Sierra Leone, and Liberia – what was known as the Rice Coast of West Africa. They were trafficked across the Atlantic Ocean directly into Charleston and Savannah, the major ports along a stretch of the Southeast Atlantic Coast where the topography was similar to the rice-growing region of West Africa. The enslaved bought with them knowledge of how to grow rice. That rice would become the economic engine for the lower Atlantic colonies and make them some of the wealthiest in what would become the United States. Tidal rice cultivation was a labor-intensive and technically difficult enterprise. Unlike other crops that require only a clearing of a field before planting, the ancestors of the Gullah Geechee had to clear many acres of land – with their hands, sometimes small tools and baskets – and then make extensive improvements to it. At first, rice was grown as a subsistence crop in damp soil without irrigation. Later, the reservoir system, which involved the impounding of fresh water from streams, springs, and swamps, was used for the periodic irrigation of rice fields. This involved situating rice fields adjacent to rivers and streams flowing into the ocean. Through an intricate system of canals, dikes, sluices, and trunks, the fields were flooded with fresh water that was forced upstream by rising tides. Africans from the West Coast were familiar with the technology of tidewater rice production and this knowledge was transferred to the New World with their enslavement. Most plantation owners were reluctant to acknowledge that it was the Africans on their plantations who had the array of technological and managerial skills that were essential to the production of rice. Their achievements are all the more remarkable in light of the dangerous conditions they endured as they worked swampy mosquito-filled rice fields that favored diseases such as malaria, cholera, and yellow fever. Many Africans from the Rice Coast possessed a degree of immunity to malaria that Europeans lacked. The European planters were often absentee owners who spent the period from early May to late October in the pinelands and the winter social season in their city homes. The result was that many of the plantations were highly “Africanized” and the work of rice production was frequently managed by the enslaved themselves under the direction of a white overseer and a black driver. The ancestors of the Gullah Geechee arrived into this new world with a diverse range of cultural, linguistic, and spiritual practices. Because many of the transplanted African peoples did not share the same cultural practices, eventually common institutions and a synthesized new creole (but still very West African) culture and language – now known as Gullah Geechee – emerged on these isolated island and coastal plantations. The Gullah Geechee can only be understood in connection to their relationship to the land of the Lowcountry, rice cultivation, and their coastal history and heritage. 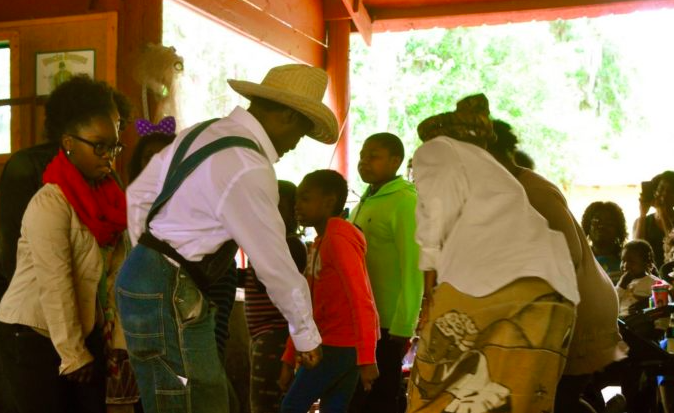 Land is still widely considered the most valuable of all Gullah Geechee cultural assets. It has always been the base for economic and social development. After slavery ended, family farms like the Fields Farm were often the primary source of income. Gullah Geechee landowners were able to develop a self-sustaining economy based on the small-scale production of cotton, subsistence agriculture, and truck farming supplemented with fishing and harvesting shrimp and oysters. As a result, many were able to avoid the hazards associated with the tenant farming and sharecropping systems. Preserved along the beautiful, coastline of the Atlantic Lowcountry is the nationally important story of the history of the Gullah Geechee people – a powerful story of how they shaped this distinctive landscape over the course of centuries and their remarkable Creole culture and West African traditions that remain deeply rooted in it. A story told in the hundred-year old praise houses that still stand on islands like St. Helena and Johns Island as testament to the vivid, spiritual life of the enslaved – and where their “ring shouts” recalled the African religious rituals of their homelands and gave brief reprieves from the horrors of enslavement. In the patiently, hand-crafted sweetgrass baskets that reflect ancient West African weaving traditions and which are made from natural materials found only along the coast. In dishes like Chef Dennis’ red rice, a Lowcountry favorite that calls to mind jollof rice and indelibly connects today’s Gullah Geechee chefs to the cook pots of ancestors and contemporaries in West Africa. And in the acres of rice fields that are still an indelible feature of our Lowcountry landscape – drive down Highway 17, the old Savannah Highway, and you can still stand in them, silent and verdant memorials to the unfathomable sacrifices and inspiring perseverance of the Gullah Geechee people. A sustained commitment to the conservation and preservation of their land and its natural resources all across the 12,000 square mile Gullah Geechee Cultural Heritage Corridor will always be integral to our work because Gullah Geechee history and culture has been inextricably tied to this ancestral land for generations and continues to be so today. Heather L. Hodges became the Executive Director of the Gullah Geechee Cultural Heritage Corridor Commission in November 2017. Under her leadership, the Commission has placed a renewed emphasis on activities designed to expand the body of knowledge on the culture and history of the Gullah Geechee people in the Low Country and Sea Islands. She has also placed a priority on facilitating heritage tourism across the Corridor and working with local Gullah Geechee preservation groups to preserve important community, cultural assets. She is also partnering closely with the National Park Service to support their interpretive work around Gullah Geechee culture and to produce cultural and historical programs for Park visitors. An honors graduate from the Tulane University School of Law, Ms. Hodges began her legal career in private practice in Washington, D.C., as an Associate at the international law firm of Arnold & Porter LLP and then as Counsel with Crowell and Moring LLP. She was the recipient of a 2010-2011 Women’s Law and Public Policy Fellowship from Georgetown Law School where she did field work exploring challenges to providing access to justice in Belize and organized programs on international human rights law. Ms. Hodges is also a documentary photographer who specializes in African, African-American and Afro-Latino culture with an emphasis on contemporary and traditional music and dance culture. She has traveled extensively including to Santiago de Cuba, Cuba, to study traditional Afro-Cuban dance; to La Sabana, Venezuela, for the Fiesta de San Juan; to Dakar, Senegal, to explore its contemporary music scene; and to Belize for Garifuna Settlement Day. She has also documented the roots of Delta blues and the Gathering at Geechee Kunda Festival in Georgia. Her photographs have been exhibited in Washington D.C. and London.